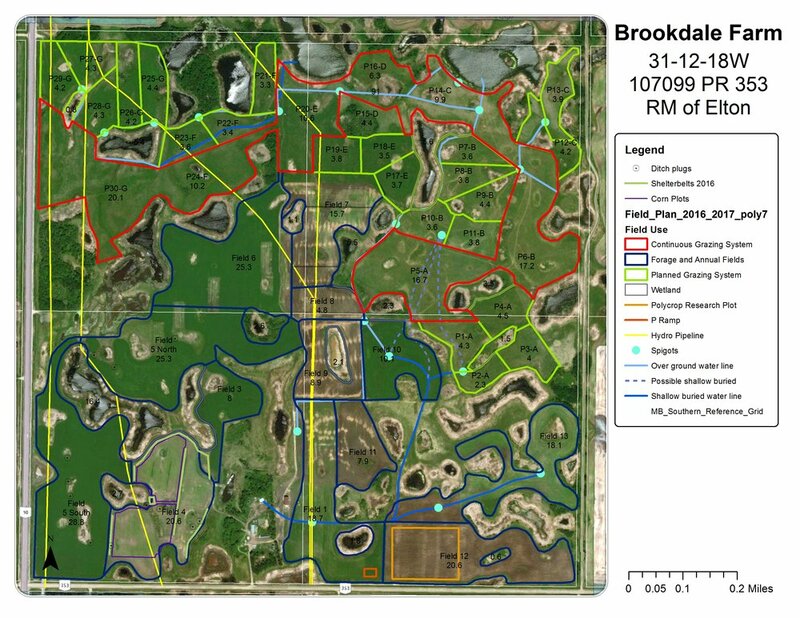 The Brookdale Farm is located 11 miles North of Brandon, at the corner of Highway #10 and Provincial Road (Hwy) 353. It is a 640-acre section of land (31-12-18W) owned by Ducks Unlimited Canada. Approximately 253 acres are wetlands, and the remaining 387 acres are used for pasture, hay, and cropland. The 10 acre yard site is home to our MBFI Learning Centre that is available as a multi-functional facility to host agriculture extension and outreach events year round (to be completed winter 2017/18). It includes an indoor and outdoor classroom areas, food prep area, washrooms and storage. The yard includes a large parking lot and upgraded driveway, with additional upgrades to field roads to permit year-round travel to each field and pasture – perfect for extension events. The Farm out buildings consist of a combined 42’ x 80’ building that includes our heated workshop and storage area (42’ x 40’) and a livestock handling facility (42’ x 40’), a 30’ x 100’ canvas event and storage shed, and a 20' x 40’ lean-to style pole shed. Our field and pasture infrastructure includes a four-strand barbed perimeter fence, many miles single strand cross fencing, an extensive Sundog Solar summer watering system covering three/quarters of the land base servicing dozens of watering points, two winter watering systems fed from our dugout, one through a solar powered crib system, the other through a Peterson drinker. Our livestock handling equipment includes both a Real Industries stationary chute system within our Livestock Handling Centre, and a Real Industries portable handling system for use in the pastures. The Livestock Handling Facility area is designed so that it can be easily converted into the most novel system. An overhead catwalk is planned that will allow producers to view the action from inside the shop and above the handling system. MBFI also has numerous portable panels, wind breaks, and feed and forage delivery equipment. The farm yard is also serviced with a Wi-Fi service, cell phone booster and a monitored security system.